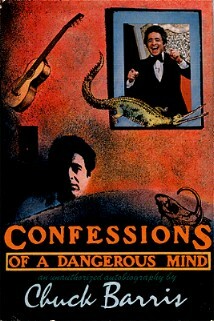 Confessions of a Dangerous Mind is one of the strangest stories to come down the pike in years. The movie is based on the autobiography of Chuck Barris...yes, that Chuck Barris, the dreadfully unfunny host of The Gong Show in the 1970s. In his book, the explanation is offered that his creation of this show, along with The Dating Game and his other, lesser-known works, was done to cover for his real job as...wait for it...a government assassin. The Gong Show Movie Barris created in 1980? I guess we didn't go as far behind-the-scenes in that classic as we were led to believe. Also confusing is how a man who could have easily been cast as Mini-Me would be so successful as a wetworks thug. What is lost on many people is that the idea for the story is, in fact, a tongue-in-cheek attempt at describing the television industry. Barris feels that his skill in getting shows on the air prepares him for only one other sort of professional employment: slayings for hire. Whether or not he really was The Spy Who Gonged Us is irrelevant, other than to make for better storytelling. The point that he became another amoral lost soul of Hollywood is where the real heart of the book lies. Anyway, the very premise of this is so intriguing that it's no wonder that the idea of a theatrical version has been kicked around ever since the novel's release in 1994. The fact that no production has occurred until now speaks more to the fact that no one was sure exactly how to make an idea such as this work. The key is obviously in the casting of Barris himself, with names such as Mike Myers, Jim Carrey and Ben Stiller being rumored. Stiller was, in fact, a candidate till the very end, but a surprise underdog managed to show he was better suited for that role. That man is none other than Sam Rockwell, the scene-stealing actor from The Green Mile, Charlie's Angels and (especially) Galaxy Quest. The reason he even had a chance to get such a huge role is due to the fact that the star power for this film will come from behind the camera. After directors such as David Fincher and Bryan Singer ended up passing on Confessions of a Dangerous Mind in order to work on other projects, A-list actor George Clooney decided this quirky concept would be the perfect debut directorial effort for him. From there, it was easy for him to line up friends such as Julia Roberts, Matt Damon and Drew Barrymore to take other roles in the film and thus relieve Rockwell of the need to be an opening-weekend draw. As if that's not enough, Clooney has cast himself in the key role of CIA agent Jim Byrd, the man who hires Barris into his shadowy secret agency. The presence of those four instantly makes this one of the most noteworthy projects of the year, and the fact that it's Clooney's first attempt at imitating his buddy Steven Soderbergh's successes behind the camera only adds to the interest. This is an early favorite for Oscar contention.